This is a tough review to do. On one hand we where going to wait till the premiere date in October. With the leak of the pilot a lot of sites decided to just post their reviews online right away. And the other makes it tough to have a detail review without ruining a fun show. But we can defiantly talk about some cheers and jeers without spoiling the show. Let me just say The Flash is good. It’s like Arrow, but a bit different, which gives The Flash its own type of storytelling. Arrow uses a lot of flashbacks. This is something I thought early on was going to get them in trouble with timelines. Also after awhile flashbacks for me can really turn me off of a story, unless like here they’re used correctly. But Arrow continues to be one of the best shows to watch, mostly do to the writing and its fantastic leads. The Flash seems more likely to follow a different path. Thou it is tough to tell at this point, being this as the only episode. The narration was good. The Flash, Grant Gustin does a very good job playing Berry Allen. I’m very glad they didn’t throw in a ton of jokes for Allen to tell like we have seen before with the character. He’s dialogue is pretty solid and this was a worry I shared at the start. Detective Joe West and Iris West where good, John Wesley Shipp as Henry Allen was a great idea (Shipp played The Flash on TV in 1991). Harrison Wells is an interesting character to say least (You’ll see what I mean). The villain was okay. The meat of the storytelling impacted the character to be given more, so it’s not a total loss. 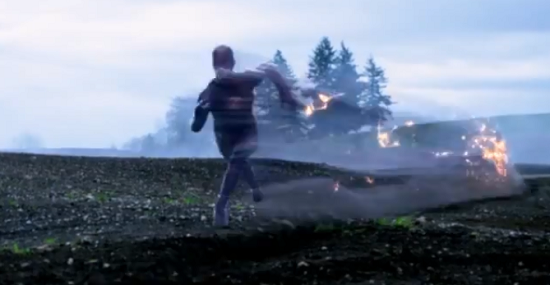 I will say this, the news of Robbie Amell (cousin of the Arrow) as Firestorm has excited me more then anything. I’m looking forward toward seeing that characters come alive. The effects are pretty good. I was wondering a bit how it would look when I first heard of the show being made. But I'm pretty happy with it. This is something more I'm waiting to see in future episodes. Smallville did a good job with this too, and I'm hoping they take it to the next level, like the flash getting stuck in a mirror from Mirror Master. All in all everything was pretty good. Only thing that I didn’t like was the amount they packed into the pilot. I’m surprised they didn’t pull a 24 and stretched it along a handful of episodes. A lot happens making the episode feel jammed packed. If they made it a 2-hour event then I could really seeing it working out a tad bit better. Definitely give it a watch if you’re a fan of the Flash, the Arrow or just like watching something fun on TV. Also keep a look for a ton of Easter eggs, for a pilot there’re some big ones.